XIMEA’s MQ013RG-E2 USB3 Vision camera offers 1280 x 1024 pixel images; sensitive in the near infrared (NIR); peak quantum efficiency greater than 70 percent; global shutter; 60 frames per second; 5 Gbps data transfers; and integrated I/O in the world’s smallest USB3 Vision-compliant industrial camera, measuring just 26.4 x 26.4 x 21.6 mm. XIMEA GmbH is pleased to introduce the machine vision industry’s smallest 1.3-megapixel (Mpix) USB3 Vision grayscale cameras with enhanced sensitive in the NIR, offering high-resolution imaging at 60 frames per second (fps), SuperSpeed data interface rates of up to 5 gigabits per second (Gbps), single planar board construction for OEM applications and integrated I/O. The MQ013RG-E2 grayscale USB3 Vision cameras are based on e2V’s Ruby EV76C661 sensors, which offer global shutter for industrial, intelligent transportation systems (ITS), defense and security, and microscopy/medical applications; high peak quantum efficiency above 70 percent; more than 62 decibels (dB) of dynamic range; 10-bit output; and support up to four separate user-configurable regions of interest. “The MQ013RG-E2 joins XIMEA’s MQ013MG-E2 and MQ013CG-E2 as the only commercially available USB3 Vision-compliant cameras on the market today,” says Max Larin, co-CEO of XIMEA. XIMEA engineers served on the USB3 Vision development committee sponsored by the AIA, the North American trade association for the machine vision industry. USB3 Vision cameras are capable of data transfers up to 5 Gbps. Measuring just 26.4 x 26.4 x 21.6 millimeters and weighing a mere 26 grams, the xiQ series cameras retain the title of world’s smallest industrial USB3 Vision camera, as well as the only industrial USB3 Vision camera to be constructed on a single planar board, simplifying OEM implementations. XIMEA’s engineers accomplish this by offloading LUT and other common camera controls for industrial applications to XIMEA’s free xiAPI software running on the host PC. And unlike any other USB3 Vision camera manufacturer, XIMEA offers cameras that are plug-and-play compatible with PCs running Windows or Linux, as well as Unix-based Mac computers. 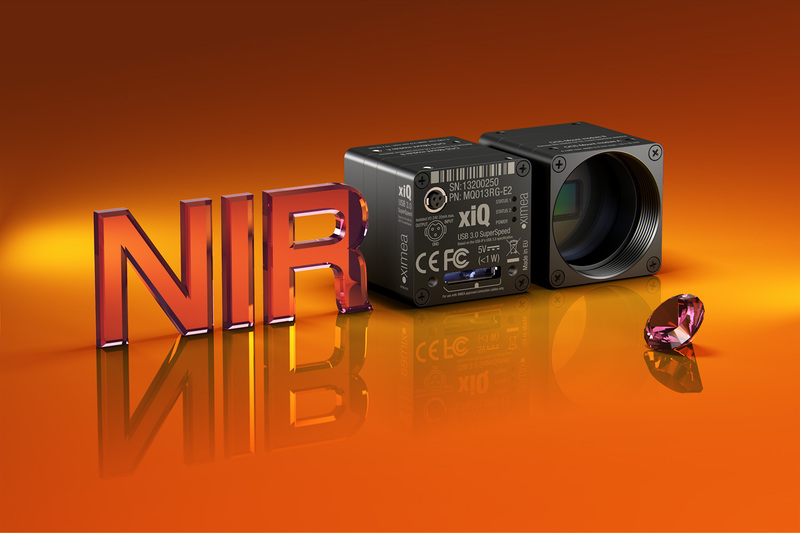 xiQ cameras include all standard I/O and features demanded by industrial imaging customers, including global shutters, integrated opto-isolated trigger input and illuminator control output, and onboard non-volatile memory for user settings and custom data. And like all of XIMEA’s industrial cameras, each xiQ series ships with application programming interfaces (APIs) for 30 of the most common image-processing software programs, including libraries from Cognex, Matrox, National Instruments, MVTec and many more.